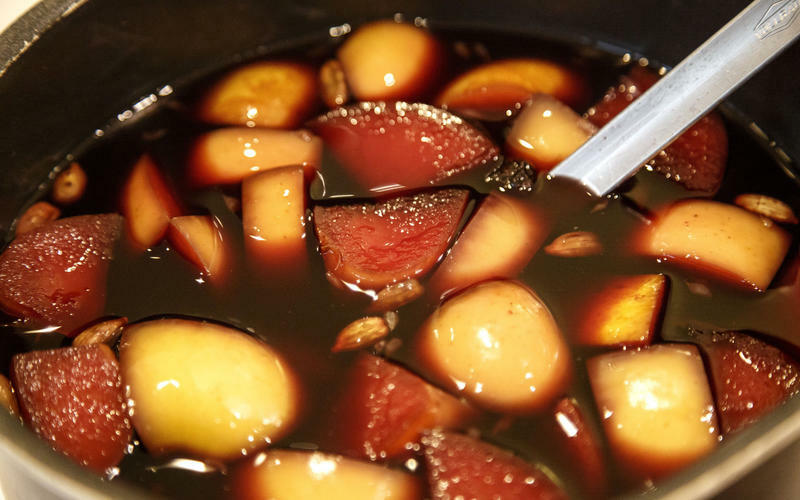 Step 1 In a heavy-bottomed pot, combine the red wine, sugar, cinnamon, cloves, allspice, anise, orange zest and juice, apple and lemon zest over high heat. Bring to a boil, then remove from heat. Pour everything into a nonreactive container, cover and set in a cool, dry place for 1 to 2 days. Strain through a fine sieve or chinois into jars or bottles, and refrigerate until ready to drink. Reheat before drinking, and check the acidity of the wine before serving, adding more sugar if desired. In Recipes-list.com we have selected the most viewed recipes from category - Drinks . Enjoy the best recipes specially selected for you! Glühwein is the right choice that will satisfy all your claims.